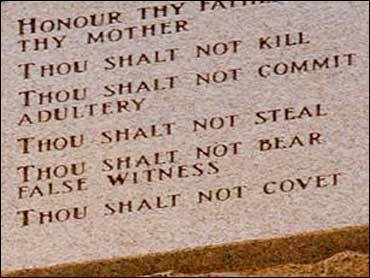 A federal judge on Friday said a Ten Commandments monument outside a courthouse can stay, rejecting arguments that it promotes Christianity at the expense of other religions. U.S. District Judge Ronald A. White in Muskogee ruled that Haskell County did not violate the Constitution by erecting the monument. The county did not "overstep the constitutional line demarcating government neutrality toward religion," he wrote. The county argued that the monument outside the Stigler courthouse was part of a historical display that included other monuments recognizing war veterans, the Choctaw Tribe and others. The Ten Commandments monument has the Mayflower Compact etched on the other side. "A significant factor is that someone comes and looks at all the monuments on the lawn, they can't just single out the Ten Commandments monument and say, `Ah ha!' and that means government is impermissibly endorsing religion," said Kevin Theriot, an attorney for the Haskell County commissioners. Micheal Salem, an attorney representing the American Civil Liberties Union and Stigler resident James W. Green, said he thought "the court's decision really represents a loss for religious freedom." He said he would have to thoroughly review White's decision before deciding whether to appeal. The U.S. Supreme Court has ruled that religious displays on government property are not inherently unconstitutional and must be considered on a case-by-case basis.